The distinguished Indian archaeologist Himanshu Prabha Ray is among this year’s winners of the Anneliese Maier Research Award. She will use the award to carry out a long-term research project at LMU, beginning next year. 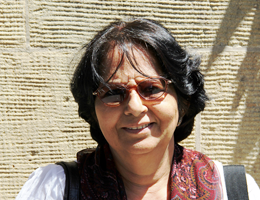 The Indian archaeologist Professor Himanshu Prabha Ray will formally accept the Anneliese Maier Research Award on 26. September 2013. The accolade will make it possible for her to pursue a long-term research project at LMU, beginning in 2014. Ray is a leading archaeologist and historian, who is best known for her work on the archaeology of Buddhism in India and the role of long-distance maritime contacts with Southeast Asia in the history of India during the centuries that straddled the onset of the Christian Era. Her research draws on a range of sources, literary, epigraphical and archaeological, including evidence derived from marine archaeology. Ray has headed the National Monuments Authority in the Indian Ministry of Culture since 2012. Prior to her appointment to this post, she held a professorship at Jawaharlal Nehru University in Delhi. She is also Editor of the Archaeology and Religion Series published by Routledge in partnership with the Oxford Centre for Hindu Studies at Oxford University. Ray was nominated for the Anneliese Maier Award by Professor Monika Zin of LMU’s Institute of Indology and Tibetology. The award is intended to fund long-term research collaborations between internationally recognized scholars in the Humanities and Social Sciences and their fellow-specialists in Germany. “We expect that, as a result of our cooperation with Professor Ray, the field of Indic Studies in Germany will attract increased international attention and interdisciplinary cooperation will be further intensified,” says Monika Zin, who currently holds the Chair of Indian Art History at the Free University of Berlin, the only such position on offer at a German university. While at LMU, Professor Ray will work in close cooperation with archaeologists, historians and art experts. The overarching theme of her project at LMU is “Cross-Cultural Dialogue: India and the Wider World in Ancient History”. “Its aim is to study interactions between the patron, imagery and the utilization of sacred spaces in South Asia and other parts of the ancient world,” says Himanshu Prabha Ray. She will begin her stay at LMU with an inaugural lecture entitled “Traveling with the Buddha – Archaeology of the Early Monastic Complexes in Peninsular India“. The Anneliese Maier Research Award, sponsored by the Alexander von Humboldt Foundation, is designed to promote the internationalization of the Humanities and Social Sciences in Germany by supporting collaborations between established international researchers and their colleagues at German institutions. The Award is valued at 250,000 euros.